If I am absolutely honest with myself, bacon will be one of the top foods I take to a deserted island. Crispy, crunchy, salty....yum! Alas, bacon is a high calorie choice and has those pesky nitrates people are trying to avoid. I am always looking for a bacon like experience without the bacon AKA “bacony”. Up there is a photo of my latest breakfast riff. My daughter walked by it and exclaimed, “bacon! !”, and I told her to give it a try. She tasted and decided that it was delicious (and could she have more). I did not tell her she was eating beets, potatoes, and parsley in a crispy crunchy salty, sweet, flavorful bacony combo called “vegetarian hash”. The red color gives the idea of bacon. If you are confused at this point in the post, I understand. This tastes nothing like a pork product, but it is a great way to serve eggs. You can also skip the eggs and just eat this plain. In addition to protein and fiber, this recipe will give you 13% of your daily value of iron, 54% of your daily value of vitamin C, and 18% of you daily value of vitamin A.
Beware this does take 50 minutes in the oven. so you cannot grab and go. You can make this ahead and heat it up for a quick consumption. I made this for lunch when I was stuck at home cleaning. This is best cooked in a cast iron skillet (see below). I love them because you can move from oven to stovetop seamlessly and they are inexpensive. They are also fun to wave at someone when angry. If you don’t have one, use another large frypan that can be heated in the oven (no plastic handle). Have you made a vegetarian hash? Please share. Heat the oven to 450 F. Combine potatoes, beets, onions, and garlic and large bowl and season with copious amounts of salt and pepper. Toss to coat. Pour oil into cast iron skillet and heat for five minutes. Remove from oven and spread potato mixture in an even layer. Roast in the oven for 25 minutes. Remove from oven and stir. Return to oven and roast until the potatoes are fully browned and crispy, about 25 minutes more. Remove from oven and mix in chopped parsley. This is ready to serve if you are not using eggs. For the egg eaters, crack four eggs over the top of the potatoes and return the skillet to the oven. Bake for 5-10 more minutes or until desired doneness. Enjoy! Ok I can't wait to see if anyone has done this or something similar. I still have a thing against beets, due to my father growing them in our garden when I was a child, and being forced to eat them, boiled. I'm edging closer to trying them again...this looks promising! Would beets out of a jar do? I buy mine already sliced and in a jar. When we roast veggies, we always precook in the microwave to reduce time in the oven (even when we aren't on a hurry.) Mic diced beets about 6 mins., drain them. Then add onions and potatoes and put them back in the bowl and stir. Mic about 4 more minutes Then drain water, put into skillet and roast. Lots of the water is already gone, and they cook much more quickly, but still have the same great texture. Yum yum, Lisa!! If you really want a bacon experience without the bacon, this would be a great dish to use a bacony meat substitute. Stripples by Worthington (in the frozen grocery section) are one of my favorites, but there are a lot of tasty ones, including tempeh. FakeMeats.com and VeganEssentials.com are good places to find meat substitutes online. 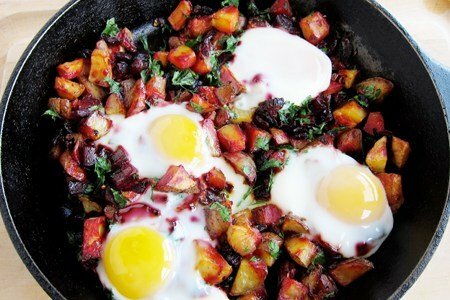 This really looks good, never thought to add beets to hash. I don't like sunnyside up eggs, but I usually make a big batch of eggs cooked in a muffin tin, freeze and defrost as needed. Makes for a quick breakfast. This sounds so good! I'd love to try it using sweet potatoes! Sue K: how do you make eggs cooked in a muffin tin? Thanks! Jenny - Beat 6 eggs and 4 egg whites together, S&P to taste. Saute chopped vegetables of your choice in a little olive oil until cooked (drain if necessary) add to eggs and pour into greased muffin tin and bake at 350 about 20 to 30 minutes. I like mine well done. If I don't feel like adding vegetables I chop up some fresh spinach and add. Maybe some cheese too. Really anyway you like. I love the idea of using beets. The color and flavor would be perfect. I make a hearty version using kasha (roasted buckwheat). You can find the recipe here, http://welcomingkitchen.blogspot.com/2009/10/brunch-hash.html. Is a serving one cup?? Sounds great! I've just recently been roasting gobs of carrots, parsnips shallots, red peppers with lemon pepper and Italian spice blend, s and p. in the a.m. I reheat in a skillet and then cover with a fried egg( fried in another pan.) never thought of beets. Will try. I love snack girl. I often make vegetarian has for breakfast. Usually it's sweet potatoes, peppers and onions with some other veg, maybe spinach or kale, maybe squash cubes. I've never tried beets, but will give that a try. My best tip in making hash is to leave the pan alone and give the food a chance to get brown and crispy. I even set the timer for 5-7 minutes and force myself to let it brown. Then I flip and set the timer again. I may have this for dinner! Last night I made riced cauliflower with black pepper and curry cooked with lots of onions, portobello mushrooms and Aidels sausage. This morning I added an egg to it for breakfast - so I guess I made a vegetable hash! Looks gorgeous, Snack Girl. I'm going to make that...and thinking that I'll chop up those beet greens and add that to the mix as well. Thanks for the inspiration. This looks yummy! Looks like a perfect dinner to me. I love breakfast for dinner. My fave: mushrooms, onion, cauliflower, sweet potato and kale. I use Clubhouse's Roasted Garlic and Red Pepper blend to flavour.